BARRICK Gold Corporation has abandoned its $18bn takeover attempt of industry rival, Newmont Mining, in favour of a joint venture in which the two companies will seek to extract $500m a year in synergies by operating their Nevada assets together. “We listened to our shareholders and agreed with them that this was the best way to realise the enormous potential of the Nevada goldfields’ unequalled mineral endowment, and to maximise the returns from our operations there,” said Mark Bristow, CEO of Barrick Gold. Bristow and Newmont Mining CEO, Gary Goldberg, have been locked in discussions since last week. Bristow said on March 8 that the discussions with Newmont had been constructive. This was after first seeking the takeover of Newmont Mining which is currently hoping to conclude a takeover of Goldcorp. The joint venture will allow the partners to capture an estimated $500m in average annual pre-tax synergies in the first full five years of the combination which is projected to total $5bn pre-tax net present value over a 20-year period, Barrick and Newmont said in a joint statement. Said Bristow: “We are finally taking down the fences to operate Nevada as a single entity in order to deliver full value to both sets of shareholders, as well as to all our stakeholders in the state”. 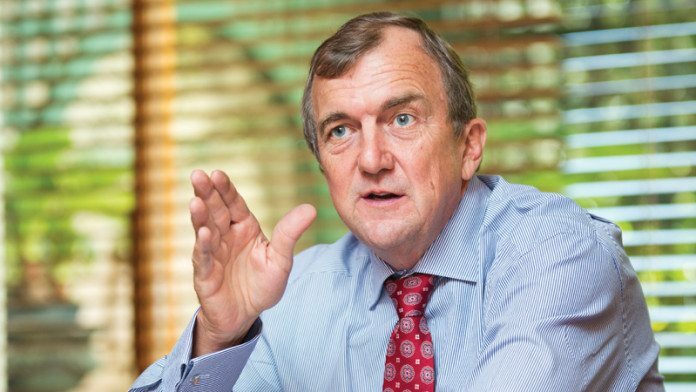 Bristow was previously CEO of Randgold Resources until it merged with Barrick in a transaction finalised on January 1. Goldberg described the agreement as “innovative” and “effective” in which the jointly operated region – the Nevada complex – would be the world’s single largest gold producer with pro-forma output of more than four million ounces. It would also pool reserves and resources of the two companies totalling 48 milling ounces and three so-called ‘tier one’ assets. The companies said the joint venture would be completed in “the coming months”, but would exclude Barrick’s Fourmile project and Newmont’s Fiberline and Mike deposits, pending the commerciality of the prospects being proved. A key element of the agreement is that Barrick would be the operator of the joint venture. In previous discussions Barrick and Newmont discussed sharing their Nevada mines, the question of which company would run them was the point of contention, and ultimately of deal failure. “As a result of this agreement, Barrick has withdrawn its Newmont acquisition proposal announced on February 25,” said Barrick of a takeover offer, first launched on February 25 and that resulted in some extraordinary interchanges between its key officers. Both Bristow and Goldberg described each other’s efforts “bizarre”: Bristow of Newmont’s plan to merge with Goldcorp, and Goldberg of the proposed takeover of his company. Goldberg also said Bristow had no experience of operating a large, multi-national company and was critical of the political risk of some of Barrick’s assets.